As we enter week 4 of the college football season, we’re seeing major disruption in The Kickoff Top 25. 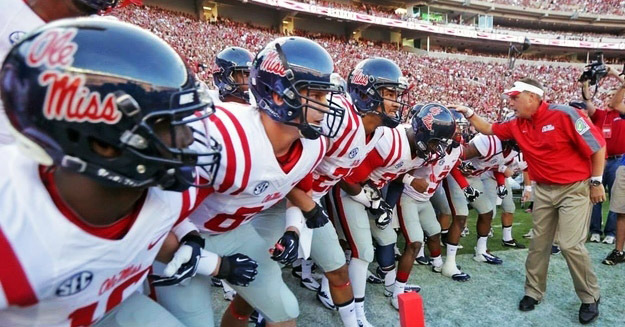 After being upset last week by Ole Miss, who we had ranked at No. 15, Alabama slipped from No. 3 on the Kickoff Top 25 all the way to No. 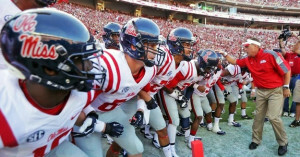 12 (The AP poll now has Ole Miss ranked third behind Ohio State and Michigan State, while the Crimson Tide is also ranked No. 12 there). Last week’s No. 13 team, Auburn, dropped out of our Top 25 altogether after losing so badly to LSU, 46-21, that Coach Gus Malzahn benched his quarterback (a pre-season Heisman candidate) this week in favor of a freshman who has never played a game at the college level but will have to rise to the challenge as the team that LSU beat by 2 points in week 2, Mississippi State, comes calling. Auburn dropped out of the AP Top 25 completely but hung on to No. 25 in the Coaches’ Poll. A mighty fall for a team that many predicted in the pre-season would earn a spot in the playoffs. The win in Baton Rouge shot LSU from No. 11 to No. 4. AP has the Tigers ranked at No. 8. They play Syracuse on Saturday. RB Leonard Fournette was one of our superlatives this week, as he had 19 carries for 228 yards and 3 touchdowns versus Auburn, fueling LSU as the hottest team in the SEC. While Auburn and Alabama fans are in shock, at least they did not fall as hard as USC, which has vanished from the Top 25 after losing 41-31 to then-unranked Stanford (USC was our No. 6 last week; Stanford is No. 21 on AP’s poll, No. 25 on ours). Other shocking upsets last week: UCF lost to Furman, Arkansas fell to Texas Tech, Iowa State lost to Toledo, and Colorado bested Colorado State. Power ratings aside, Georgia has replaced Alabama and Auburn as the SEC teams most likely to be Top 4 Seeds from the Playoff committee, along with Ohio State, TCU and Notre Dame. Our pick of the first 4 out? Probably UCLA, Michigan State, FSU and LSU. In terms of conferences, the Big 12 leads with the highest percentage of wins, followed by the Pac-12. The SEC comes in third, then the ACC, Big 10, American, Independent, MAC, C-USA, Sun Belt, and MWC. TCU and Ohio State swapped places on our Top 25 this week as the Horned Frogs edge the Buckeyes on our Power Ratings. Georgia Tech fell from No. 9 to No. 19 in our Top 25, while Oregon, Oklahoma, FSU, Arizona, Utah, and Wisconsin are all on the upswing. Our No. 14 team, Oregon, plays our No. 18 team, Utah, is one of our Kickoff Games of the Week. Oregon leads the series 20-8, including last year’s 51-27 rout. We’re picking them to repeat again on Saturday. Our other game of the week features two teams that have struggled in recent years but are rebuilding, Tennessee at Florida. We’re picking the 3-0 Gators to win in what might be a close one. They lead the series 25-19 over the Vols and narrowly edge them in our Power Ratings, so it should be a pretty good game with both teams about even. In our most recent edition of The Kickoff, published Sept. 21st, we have news and notes, a listing of the 78 most highly paid coaches in college football, complete FBS and select FCS schedules and results thus far in the season, our Kickoff Top 25, information on those games of the week, our Kickoff Playoff Seeds, information about the “targeting” rule (which we’ve seen applied in some games this year), and, of course, our Kickoff Power Ratings with the teams playing this week, along with our picks to win, comparative ratings, and last year’s score so you have the data you need at a glance to make your selections in your office pool. To subscribe, visit https://thekickoffstore.com/subscriptions/individual/ . You’ll get all of our issues so far in the season and a new newsletter each Monday (email/PDF subscribers only, during the week for first-class mail subscribers to our printed edition). For a limited time, when you subscribe to our email/PDF version for just $20, you can sign up a friend to receive The Kickoff in his or her email inbox for FREE. What a great buddy that would make you! Also, test your knowledge of college football by participating in our Thursday Throwdown questions. We’ll see whether we can stump you (no cheating). It’s already Week 3 of the College Football season with some great games ahead this weekend. The Kickoff Games of the Week are Georgia Tech at Notre Dame and Ole Miss at Alabama. The Yellow Jackets enter the game ranked at No. 9 on the Kickoff Top 25 this week, jumping two spots from last week. The Fighting Irish, right behind them on our rankings, lead the series 27-6-1, including a 15-3 record when hosting. The teams are meeting as part of a deal with the Notre Dame and the Atlantic Coast Conference. This has been a heated rivalry over the years with Tech fans pelting visiting fans with fish during the sixties and seventies, as portrayed in the movie Rudy. Their last meeting was in 2007. It will be fun watching them battle it out again. After beating Wisconsin and MTSU, the Crimson Tide (ranked No. 3) continues to look strong as they enter Conference play against the Rebels, who won their last two games 76-3 and 73-21 versus Tennessee Martin and Fresno State, earning a No. 15 rating on our Top 25. Without about 3.2 points difference on our Power Ratings, we expect Alabama to win this one. 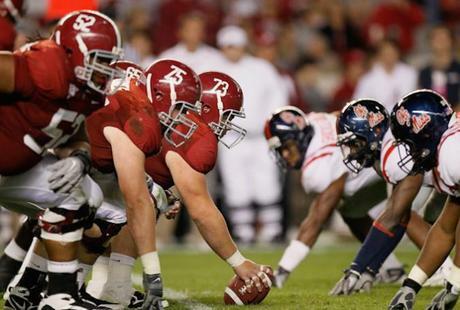 The Tide has history on their side, leading the series 24-1 when hosting Ole Miss and 48-8-2 overall since 1907. Ole Miss QB Chad Kelley was one of our superlatives for his performance last week as he went 19-24 for 360 yards and four touchdowns. Bama’s bitter rival, Auburn, tumbled 10 spots in our Top 25 after struggling to beat FCS opponent Jacksonville State in overtime at home last weekend. We were as guilty as anyone for buying into the pre-season hype about the Tigers and Quarterback Jeremy Johnson as Playoff and Heisman contenders. Saturday’s game in Baton Rouge was supposed to be one of the better games all year, but we expect LSU (now ahead of Auburn on our Top 25 at No. 11) to have vengeance on their minds after seeing Auburn’s struggles so far and remembering the 41-7 loss last year in Jordan-Hare. Whether it’s a close game depends on if Auburn took last week’s humiliating near-loss as a wakeup call. Will Muschamp will have to figure out how to stop Leonard Fournette, who had 28 carries last week for 159 yards and three touchdowns. No. 1 Ohio State should have no problem putting away Northern Illinois. Same with our No. 2, TCU, as they host SMU. Michigan State jumped 3 spots in our Top 25 to No. 4 after upsetting Oregon, which fell from No. 6 to No. 16 (the Spartans play Air Force while the Ducks will take out their frustration on Georgia State). Baylor remains at No. 5, followed by USC, Georgia, and Clemson (who play Rice, Stanford, South Carolina, and Louisville respectively). Louisville, by the way, is 0-2 for the first time since 1998 after being upset by Houston 34-31 last week. Tennessee dropped out of the Kickoff Top 25 while Oklahoma jumped from No. 21 to No. 17; the Sooners showed a lot of determination last week in a hostile environment, beating the Vols 31-24. Last week’s No. 16, Boise State, also leaves the Top 25 after losing to No. 18 BYU 35-24. The same can be said for last week’s No. 22 Arkansas, now 1-1; the Razorbacks were expected to be much better than Toledo. Texas A&M joins the Top 25 at No. 21 after defeating Ball State 56-23 while Arizona State enters at No. 25 after beating Cal Poly 35-21. In this week’s issue, we shared the Conference Breakdown through week three, ranking on home attendance last season, the largest attendance increases from 2013-14, the Football Bowl Subdivision Standings, the Football Championship Series standings, our Kickoff Playoff Seeds (including the first four projected out), our Power Ratings for this week’s games, and the schedules and results for every FBS team (and select Division I FCS schools).